Valar Morghulis. Translation: All Men Must Die. 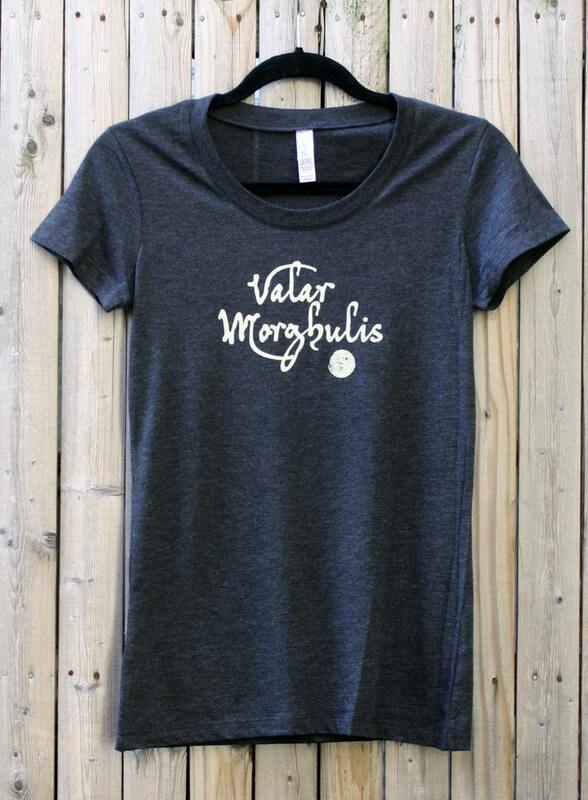 • Tee is ladies scoop neck in heather black with cream colored ink. • Chest measurements in inches: M: 33" L: 35" XL: 37"
Adorable! Will definitely visit again. Great shirt, absolutely perfect, the printing is a clear soft white and the shirt has the appearance of being “broken in”. Shipped immediately and received quickly. The sizing is as warned on the page, it runs at least one size small. I usually order a M and the L that I received looks about the normal M size. If you’re more full figured you may want to order 2 sizes up on the women’s cut shirt.